Pro-Development » Is a lack of focus on employee engagement impacting on increased mental ill health? Is a lack of focus on employee engagement impacting on increased mental ill health? I was talking with a prospective client this week who are concerned at the increase they are seeing in sickness due to Mental ill health. It was interesting as they had mixed thoughts as they wondered whether it was good that people were now feeling able to say that their sickness is due to mental ill health. Regardless, it was a big concern to them! And quite right too. With Mental Health Awareness day yesterday, it highlighted again the importance of this to our businesses. We’ve been discussing this quite a bit at work here and with our existing clients. The Mental Health foundation share “For many of us, work is a major part of our lives. It is where we spend much of our time, where we get our income and often where we make our friends. Having a fulfilling job can be good for your mental health and general wellbeing.” A recent article in the guardian shared research that showed that of the people they were working with who were suffering from mental ill health, around 87% of them were not happy at work! At Pro-Development we’re working really hard to help local businesses with this issue through our employee engagement work. We know that in the businesses that we work with who are actively working on their employee engagement and looking at ways to engage and develop their people, they have a happy and healthy workforce. Do you know how engaged people are in your business and if people have a good sense of wellbeing at your workplace? Are you doing enough to engage your people and in the right areas? To find out more about our approach to employee engagement, click here. Or, why not come along to our next workshop on the morning of the 17th October, by clicking here to book your place. Just £30 + VAT + booking fee for the morning including refreshments followed by a light lunch.or more information and to book your place. One of our clients who we have worked with now for 5 years has recently achieved a whopping 96% engagement score in their business and their team LOVE working for them. 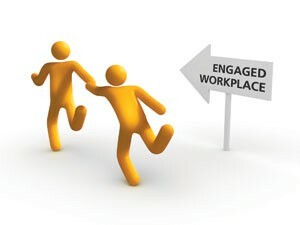 What difference would it make to your workplace if you could improve your employee engagement?